God’s Word has lasting impact when people hear it in their own language, hold it in their hands and read it. “Our friend Lamek has completed his work on earth that he did with us and God has taken him,” Toido wrote to missionary Les Wells. 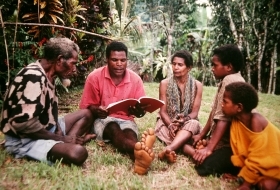 Lamek, an elder in the Pawaia church, “loved to … teach,” Les wrote, and was leading efforts to teach more Pawaias to read and write their own language. Pray for his family and the Pawaian believers, and “pray that someone else will fill the huge gap he has left behind,” Les wrote.